(Click your MOUSE to Enlarge) This landscape with the serpentine river and hills stepped to either side like artifacts reveals a nature so obedient to forces as predictable as a French Curve or as obedient as a bible college geologist that it seems painted. Whether idealized or recorded, where is it? I first went for the Grand Ronde River in the northeast corner of Oregon. It has scores of curves to explore looking for one that matches these. But that river is not this big, and its sides are ordinarily steeper and its habitat kinder to evergreens. 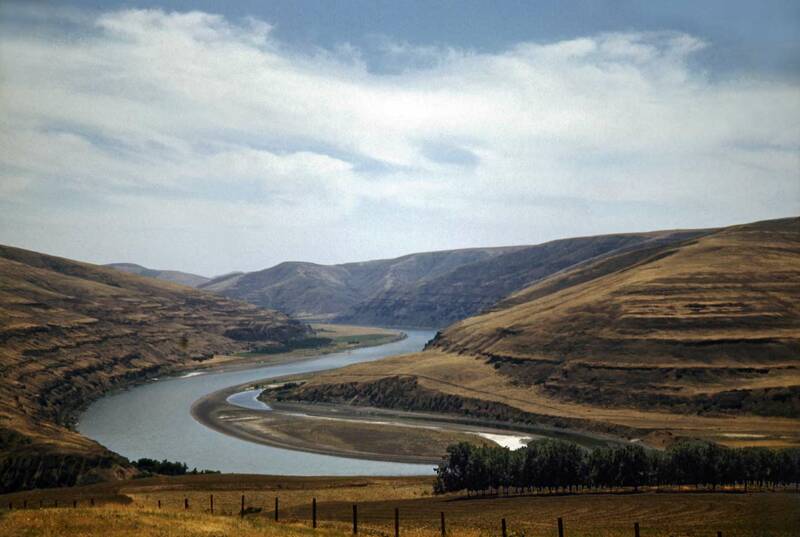 The Grande Ronde is, of course, a tributary to the Snake River, and about thirty crow-flies miles northwest of where the Grande Ronde joins the Snake River south of Asotin, Washington, the by then slack water Snake reaches the Lower Granite Dam, the last of four dams built between the Columbia and Lewiston-Clarkston – all of them with locks. If the crow flies over the dam and continues towards the northwest in about another four miles the bird may wish to stop and rest here on this hill, which Horace took for his prospect. It looks southeast through the curves that are now still evident in the river although without the sand bars. Again, the Snake is now one long lake – or four lakes between Ice Harbor Dam, about ten miles up stream from the Columbia, and the twin cities of Lewiston and Clarkston, which because of the dams are now acting like ocean ports – small ones. From this prospect today Horace would see the dam upstream and also directly below him the primarily wheat shipping port of Almota. And about half way between the dam and the port he could not help but notice Boyer Park and Marina on the left bank, a sturdy development with lots of room for power boats and camping too. Now below Horace’s hill three paved roads meet. Washington Hi-w’y 194 comes through that cut bottom-left and meets the Almota Docks Road and the Lower Granite Road on the north (or here northeast) side of the Snake. In all it took millions of years to create this spectacle but only an afternoon or two to parcel it with a fence.